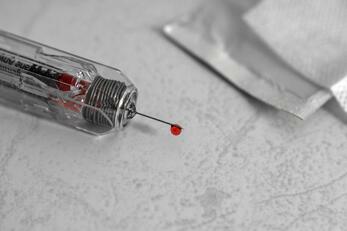 Can Getting A “Young” Blood Transfusion Turn Back Time? Conditions such as immunodeficiency and bleeding disorders are powerful growth factors of the blood plasma industry. In a recent analysis, BCC Research found that the rising demand for immunoglobulins (more commonly known as antibodies), an integral part of the immune response, is the main driver of the global market for blood plasma products. Product launches and improvements in existing technologies are expected to expand this market from approximately $16.8 billion in 2016 to $23.0 billion by 2021. Deficiencies in a blood plasma component can result in the onset of disease, which has led to acceleration in both basic and targeted research and development in this area. Blood plasma is a part of effective treatment for many chronic and life-threatening diseases such as hemophilia, leukemia and immunodeficiency disorders. Blood plasma products have proven to be a boon for patients who suffer from such diseases. During BCC Research’s forecast period, neurology is expected to dominate the global blood plasma market. Another group is testing blood plasma donated by healthy young people for its ability to help reverse Alzheimer’s disease in older adults. However, the first rigorous clinical test of this application found that the treatment produced minimal—if any—benefits. Caregivers for 16 people with mild or moderate Alzheimer’s disease reported that the patients performed slightly better at daily tasks after receiving weekly injections of young plasma. But the patients did no better on objective cognitive tests administered by researchers—a crucial standard for whether the treatment had a significant effect. The Alzheimer’s disease trial was sponsored by a California-based startup called Alkahest. Three years ago, Tony Wyss-Coray’s lab at Stanford University found that injecting old mice with the plasma portion of blood from young mice seemed to improve the elderly rodents’ memory and ability to learn. Last year, his group reported that injections of young mouse plasma improved cognitive function in mice with a form of Alzheimer’s. So, to that end, Wyss-Coray co-founded Alkahest to test whether young plasma (from [human] 18- to 30-year-old male donors) could similarly help people with mild to moderate Alzheimer’s. By geography, the global blood plasma market is categorized into four regions: North America, Europe, Asia-Pacific, and Rest of World. North America held the largest market share in 2016, accounting for nearly $8.2 billion. At a five-year compound annual growth rate (CAGR) of 6.3%, this region is expected to total $11.1 billion by 2021. The United States leads the North American market due to the surging demand for hemophilia therapies. The Asia-Pacific region, led by China, held the second largest market share in 2016 with $4.3 billion. At a CAGR of 7.1%, $6.1 billion in revenue is expected by 2021. In addition, China has adopted several plasma-fractionation technologies to ensure a sufficient blood plasma supply throughout Asia. Growth in China is supplemented by increasing government initiatives to encourage blood plasma donation. Yet the majority of markets in the Asia-Pacific and Rest of World regions are untapped and thus provide opportunities for manufacturers of blood plasma products to expand. The European market accounted for $3.7 billion in 2016 and is expected to reach $5.1 billion by 2021, at a CAGR of 6.5%. Rest of World (which includes Latin America, the Middle East and Africa) accounted for $447 million in revenue and is expected to reach $624 million by 2021 at a CAGR of 6.9%. 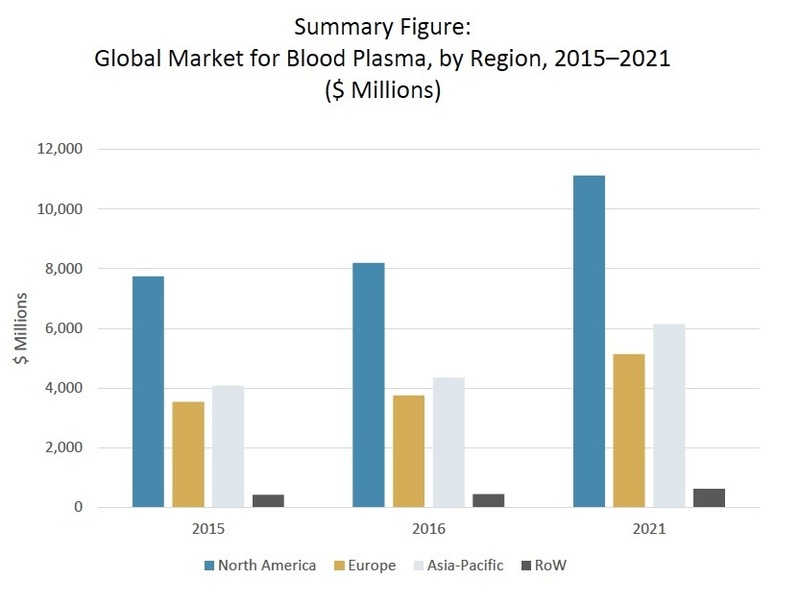 For more research and market forecasts, download the report overview for Global Markets for Blood Plasma Products (HLC201A).